It’s fairly safe to say that Arizona manager Kirk Gibson doesn’t care for Ryan Braun that much. Braun torched Gibson’s Diamondbacks in the 2011 LCS, just before Braun was found to have been taking some form of PEDs. The suspension, repeal fiasco, and Braun’s name coming up in the Biogenesis scandal never sat right with Gibson and he’s been a vocal critic ever since. This fact and this fact alone could be the reason D-Backs reliever Evan Marshall threw at Ryan Braun twice in a row, hitting him the second time and earning an ejection. It could have been compounded by the fact that Brewers starter Kyle Lohse hit two batters himself earlier in the game. It could have to do with the two batters that were hit the night before. There could be a lot of reasons for it, but one thing is clear; the Diamondbacks playing tough-guy baseball was a bad move as far as the numbers go and ended up costing them the game in this case. Let’s backtrack a little bit. In the bottom of the first inning with the score tied, Lohse got ahead of Didi Gregorious 0-2. Lohse threw a slider in. It grazed Gregorious. It’s the first batter of the first inning. The game is tied. I’m not inside Lohse’s head, but it seems as if the pitch just ran in a little more than anticipated. If Lohse were looking to make a statement, doing so on a slider with an 0-2 count doesn’t seem like the most effective way to do so. Besides, Lohse is a fan of throwing his slider down and in (or both) to lefties as this heatmap from BaseballSavant shows. 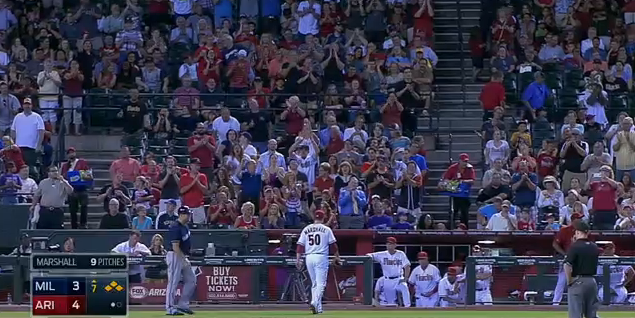 In the top of the sixth, with the D-Backs up 4-2, Lohse hit Chris Owings in a scarier moment. Owings has 299 career plate appearances, 13 of which were against Milwaukee and none against Lohse before this game. This doesn’t give a lot of history for bad blood. While throwing at batters is still a “part of the game” for some, it’s extremely taboo to aim for a batter’s head. If you look at Lohse’s reaction, he doesn’t look too happy. 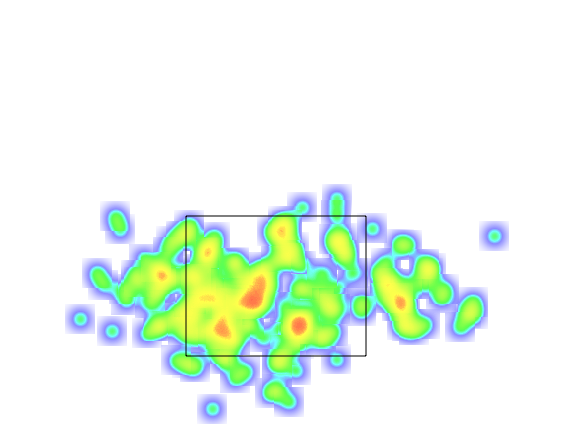 Lohse had been struggling with command all night, throwing only 63% of his pitches for strikes. And though he might not know that putting a man on in that situation would raise Arizona’s win expectancy from 85.6% to 87.4%, it would be fair to assume that he knew he wouldn’t be helping his team any. Again, I can’t speak for Lohse, but I’m guessing his lack of command contributed more to this than malcontent did. Did Kirk Gibson take offense to this? I’m sure he wasn’t happy about it, but I can’t say that he decided to enact revenge for these two acts. If he did, he picked a really dumb time to do it. In the next half inning, Jean Segura tripled and was driven in by an Elian Herrera sac fly. Lyle Overbay singled and Scooter Gennett doubled in the next two at-bats. As Lyle Overbay is Lyle Overbay, he couldn’t make it home on the double and stopped at third. One out, runners at second and third. Let’s pause here. 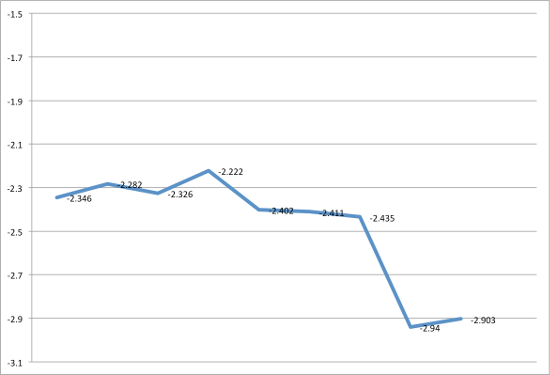 I created this run expectancy chart using Retrosheet data between 2010 and 2013. It shows the average runs scored in those four years given any base/out scenario. After the Gennett double, the Diamondbacks were already in trouble. Because it was a one-run game, the win expectancy mirrors this as the Diamondbacks’ chances dropped from 69.9% to 52.8%. Home field advantage gives them about a 2.2% bump over even, so they are basically in the same spot as they were when the game started. Up steps Ryan Braun. If Miguel Montero doesn’t make an almost-blind catch, that’s almost a certainly a run right there. The umpire doesn’t warn Marshall but walks the ball back to the mound and talks to him for a second. Marshall throws another pitch. Marshall’s release point changed by a half a foot on those last two pitches. That’s a heck of a slip. Marshall was ejected and left to a standing ovation. Hey! You gave our favorite team a worse chance of winning! Great job! All emotion aside, this was basically a walk to load the bases with one out. I get the idea — try and induce a double-play. Perhaps the better move would have been to pitch around Braun a little, hoping he’ll chase one and hit a soft grounder forcing the runners to stay, or creating a play at home. I get that Braun is not a batter you want to face in this situation. His wRC+ in 2014 is 127, a good number. But the following batter, Jonathan Lucroy, owns a 160 wRC+, has a 225 wRC+ in June, and had already hit a homer this game. Ryan Braun had never been hit by a pitch while facing the Diamondbacks, and they picked a hell of time to start doing so. Many jokes have been made about Arizona’s commitment to “playing tough” or “playing the right way” or whatever you want to call it. It’s a mantra adopted by GM Kevin Towers and precipitated through the ranks of the organization. The Diamondbacks want ballplayers, they want gamers. They want guys who won’t be pushed around. There are certain immeasurable facets of team building and clubhouse chemistry that we can’t put our fingers on. We don’t really know how much managers affect teams or how team standards and goals affect performance. Arizona has fluctuated between good and poor in the past few seasons. Some has to do with talent, some with injuries, some with random chance. But in this specific case, Arizona’s tough-guy attitude measurably and substantially hurt their chances at a win. Though Marshall was struggling a bit, the plunking caused him to get tossed and forced Gibson to bring in a reliever with worse strikeout and walk rates. It caused the expected runs for that inning to go up by .17. It caused their win expectancy to drop from 52.8% to 51.2%. These aren’t huge shifts, to be sure, but they are shifts that the Diamondbacks just gave away without making the other team try to do anything. They helped the Brewers — they gifted them a better opportunity to win. The Diamondbacks’ new win expectancy? 10.3%. According to our projections, the Diamondbacks have the same chance of making the playoffs as the Mets and Cubs do. Weird baseball can happen, but Arizona is pretty much out of it already. Perhaps Kirk Gibson has succumbed to this fate already. Perhaps he knew the basics of the expectancy numbers even if he didn’t know them to the decimal. Maybe he just didn’t care. Maybe he was peeved about getting routed the night before, peeved about letting the Brewers so close to the lead, and wanted to just hit a guy he didn’t like very much. It’s possible Marshall acted alone, I guess, though Gibson certainly had an opportunity to set him straight after the first pitch. The Diamondbacks are within their right to play baseball however they want. If they want to play a little dirty while also hurting their team’s chances, so be it. But as Arizona continues to try and get better in the next couple years, this kind of attitude might just come back to bite them. Unless winning games isn’t the point. In which case, great job. We hoped you liked reading The Diamondbacks’ Grit vs. Win Expectancy by David G. Temple! The Brewers announcers also pointed out last night how Gibson could have brought in a lefty reliever to face both Overbay and Gennett – two consecutive left handed hitters. Instead he brought in the righty reliever – Marshall – and then both lefties (Overbay and Gennett) got base hits. He basically gave away a chance to win a game in order to prove a point. In my opinion – he should be canned for that alone. Not noted in this article Ziegler wasn’t warming up to come in. That was the 16th home run Ziegler has allowed in his career in 432.0 total innings. Happy coincidence.